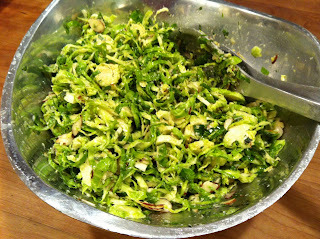 I wasn’t actually a big brussel sprout fan until I tried them raw, now it’s a staple veggie in our house. After peeling away any brown outer leaves I shred them individually by holding the stem end and slicing them thin, about a sixteenth of an inch thick, right down to the base. Then it’s just a matter of tossing them with extra virgin olive oil, lemon juice, and kosher salt. Parmesan is also a great addition and this time around I found a quarter bag of sliced almonds in my pantry so I threw those in too….great crunch. I plan on about four sprouts per person but unlike a typical salad they are great the next day so no problem over shredding. Give them a try…I guarantee you will be very surprised.